I don't think it is useful to repeat the description of the parameters since they should be inherited from the parent class. So maybe we should just remove the javadocs of this method and move the reference to the source of the algorithm to the class-level javadocs? Hmm, ParseField.match nevers throws with empty flags, what is your goal here? Also, is it ok to ignore the return value of match? ParseField.match should throw an exception if the flag contains strict and a deprecated name was used. It does currently not make sense at all as the flag is always empty. The reason for this is that the parse flags are currently not passed on to the different aggregation parsers. However, I now think adding the check with empty flags was a bad idea as it causes confusion already. Should I remove this check everywhere? I removed the match checks with the empty flags in "remove EMPTY_FLAGS check as the match..."
* in the subset than in the background without the subset. Can the two above properties be made final? These checks seem to be duplicated in most instances, can we try to share the code in a parent class somehow? Additionally, in that particular class, it seems like 0 should be avoided as well since we are taking a log? yes. I added the distinction between if background is superset or not to GND also. Commit is "make gnd also distinguish..."
yes, I removed them in commit "make gnd also distinguish..."
The class of the object is not taken into account so it would be very easy to generate collisions with instances of MutualInformation and ChiSquare. Do we use these objects as keys of hash tables or rely on the equals method somewhere? I use the equals(..) in tests in SignificanceHeuristicTests . I thought (and @s1monw requested in this comment) if you override the equals you will also have to override hash just to be on the save side. So, now I added a hash function for each of the heuristics to avoid collisions in commit "add hashCode() to each heuristic that actually has instances". Please check if this is the way to write a hash function. I think there is a thread safety issue here since this method updates an instance member while it could be called from separate threads at the same time? I think it's ok to allocate one each time as this would be an easy job for the JVM's escape analysis? ok, added commit "new frequency each time score is computed"
I think we should also briefly try to explain how they differ (on a very high level) and when each of these heuristics should be used. I left a couple of comments. Something that looks important to me is to explain how these heuristics compare, otherwise it would be hard to find out which one best fits given data/use-cases? 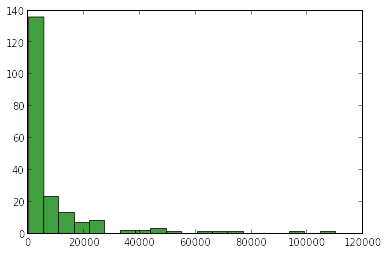 Regarding the heuristic comparison for the docs: How about an experiment using a large corpus like the Wikipedia. You could plot the distribution over document frequencies of the top-X significant terms to a large number of randomly generated queries for each of the different heuristics. My gut feeling tells me that you see differences in the distributions. Then you could advise to use heuristic A if you are interested in rather rare terms with a very strong correlation or to use heuristic B if you are interested in rather common words with a possibly slightly lower correlation. Thanks for the review! I added commits to address the comments. Next I will try to come up with a way to show the difference between the heuristics. I'll start with what @hkorte proposed. I made some plots. Let me know what you think. I also added example results but I do not think that looking at examples tells a lot about quality of the result. "query term" here refers to the set of documents that contain one of the random terms. "other term" is the set of documents that contain another term which is potentially significant to the query term. "num co-occurences" is the set of documents that contain both terms. co-occurrence: How big is the set of co-occurring documents? other term: How often does the significant term appear in the whole set? 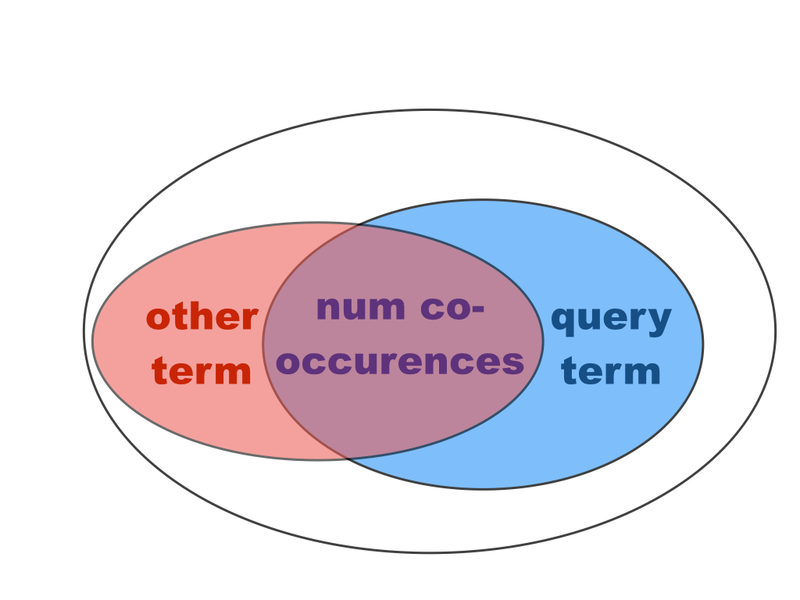 co-occurrences/ # num query term: How many (in percent) of the documents containing query term also contain the significant term? co-occurrences/ # other term: How many (in percent) of the documents containing the significant term also contain the query term? For example, a high value for 1. and 3. and low value for 2. and 4. would indicate a preference of the heuristic to select terms that often appear together with the query term even if it they also appear in the background frequently. In addition, show the resulting significant terms for one term that occurs often in documents and one that occurs rarely just to get an idea. 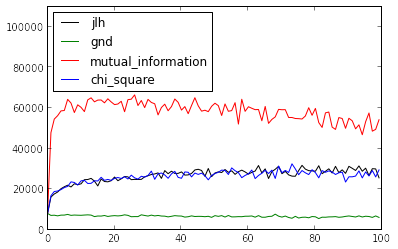 Mutual information seems to select frequent terms more often than rare terms. This might mean that you end up with lots of stopwords as for example in the "shoe" example. 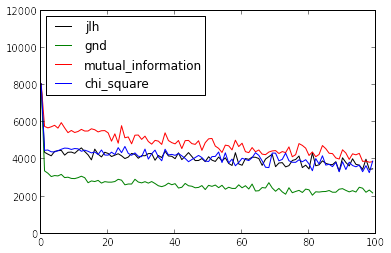 Google normalized distance seems to favor less frequent terms. This might be good for avoiding stopwords but you might also end up with, for example, misspellings as for example in the "shoe" example. 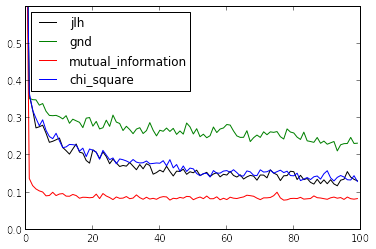 Chi square and jlh perform comparably and are somewhat in between. It will be hard to say which one is "better" because the usefulness of the significant terms seems to be tied to the application they are used in (see for example Yang and Petersen where they evaluate goodness by measuring performance of feature selection methods by evaluating the performance of a subsequent text classification using the features). If no one objects I will add this little analysis to the documentation. I addressed all comments in separate commits. Let me know if they make sense! // here we check if the term appears more often in subset than in background without subset. Should it be Double.NEGATIVE_INFINITY instead?